The Gerber Lariat incorporates a few modern folding knife features into a very utilitarian design, which in spite of being practical has little of the class most knife enthusiasts expect. It reminds me very much of the kitchen tools built for arthritic hands, with soft oversized handles that are hard to drop. Undoubtedly this is a better knife than it looks. 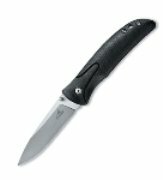 The 3.5" stainless blade is a combo edge and does have dual thumb studs, making it a good knife for lefties. One handed opening for either hand isn't very common. With a lanyard loop through the lanyard hole I think this would be a good knife for a sailor, or anyone who has to work with hands so cold you can't use your thumbs at all. A sheath is included, which makes up for the lack of a pocket clip. The biggest selling point I can see in the Lariat is that you could toss it in the bottom of a gear locker or a tackle box and dig it out a year later with confidence it would still have an edge. My fishing knives are usually knives like this one, the kind that I don't worry or care about very much. If they get wet or get lost, so what? Over time you might grow to like it, but even lefties deserve something with more class.